When I began seeking the fulfillment of D&C 93:1 in my life, I inadvertently enrolled in the school of hard knocks. I had to learn some lessons — often painful lessons — to teach me to trust in the Lord. Do not view the path to obtaining such a blessing as easy, or something which can be done casually. You may be tempted to disregard, minimize or forget many of the concepts and teachings that will move you forward in a significant way. Even if you put them to the test, you may stumble and fall every now and then. I have, and I still do. Along these same lines, I think it’s important to remember that each person’s path back to the Lord is individualized, customized and personalized. Like snowflakes, no two paths are exactly alike. I have a friend who is deeply, deeply interested in others’ personal, sacred experiences with the Lord. While I suppose that learning from their accounts may have some value, the greater value lies in pursuing your own path. Sure, you may experience similar signs (such as D&C 93:1) on your path. However, it will (more likely than not) differ from another’s. Do not see such an event as a “goal” or another “worthy objective” to obtain, as if it was something to be listed on a resume or a bucket list. To illustrate: Almost seven years (to the week) ago, I was laid off my job. I was really distraught, and didn’t know what I would do. One of my first inclinations was to go get a priesthood blessing from a good friend. In the blessing, I was told that I could go out and get a job, and that I would obtain one. However, if I received the Lord’s counsel and did certain things with respect to my spiritual development, I would be blessed with a job via a friend — a job that was beyond my expectations, and would receive many blessings from it. I chose to receive the Lord’s invitation, and do the things He was asking of me while I searched for a new job. Sure enough, six weeks later, I was offered a job through a friend of a friend — a job which continues to bless me to this day. As mortals, we are conditioned from an early age to obtain things. When I picture the word obtain, I see peoples’ hands extending in a grabbing position, palms down. Being blessed with a testimony of Christ in the flesh is not something we obtain, grab or take, but instead, we receive, allow and exhibit patience. I think we would do better to view life as a process of receiving (not obtaining), with hands extended and palms up, being grateful for all that the Lord gives to us, on His timetable. Obtaining seems selfish; receiving seems patient and grateful. I hope that makes sense. In my opinion, the Lord knows full well what the desires of your heart are. It’s no surprise, it’s not news to Him that you wish to have an audience with Him. Instead, He wants you to seek Him, and in so doing, your actions will speak louder than words; they’ll be your calling card. You have no guarantee that you’ll have an audience with the Savior in the next week, month, year or decade. But I have no doubt that, by doing what the Lord has invited you to do, He will live up to every promise He’s made you…and then some (rarely, if ever, have I seen the Lord not exceed His promises to me). In His due time, and at a time when you least expect it, He may very well appear to you, call you by name, embrace you, minister to you and bless you as you wash His feet with your tears and develop an unshakable testimony of Him, despite anything and everything the world and Satan can and will throw at you. What lessons have you learned on this path? I’d love to read your advice. Just a small contribution, thanks to someone else’s insight I needed.After reading recent articles by Eric, I have prayed to understand how to offer mighty prayers. After my most recent prayer to know more about mighty prayer, I was lead to read an article from Ted Gibbons that is helping me with one piece of the picture of what I can do. Here is the address of the article for your review: http://ldsmag.com/article/1/12797 Hope it helps someone else too. In response to gaining and “Seeking your Audience With The Lord Part 3” D&C 93:1 does not necessarily mean that we will see the Lord in this life for D&C 88:68 reminds us that it will be “in his own time, and in his own way, according to his own will.” Thus, it could be during this life or in the next. A powerful witness that the Savior exists can come through the Holy Ghost thus if we fulfill all the requirement listed in 93:1 we can “see” the Savior and “know” now by the power of the Holy Ghost that He is. Alma 40:11 states, “the spirits of all men, as soon as they are departed from this mortal body, yea, the spirts of all men, weather they be good or evil, are taken home to that God who gave them life.” All will see their maker again. What does it mean to stop and sink slowly into the straight and narrow path? I’m slowly learning that I need to trust in the Lord, perhaps even more than trying to earn His trust. When I focus so much on trying, I am often disappointed with my own results. It is the trust and reliance on Him that has brought me closer to Him, in spite of all my failed efforts. I agree, M K. It’s the trust – relying on His atonement. Relying on our own efforts is just like relying on the arm of flesh. Well said Paul. I fully agree. Three things have made all the difference for me. 1. Believe. Believe that whatever great blessing I seek, the Lord really wants me to have, and that with His help it really is within my reach. 2. Humility. The things of God have come to me according to His will, not mine. They came according to His timing, not mine. 3. Counting the cost. What price am I willing to pay? What am I willing to give up, do, change, or go without? What can I do to further sanctify myself? I really love this post. I think of the words used here like journey, seek, follow and trust are well said and used. When I think of seek, I think of hide and seek, that childhood game we all have played before and some still do with children and grandchildren. If we were “it”, we had to go out into the darkness and search diligently to find those who were not readily seen. I think of the Hebrew word Elam, which means hidden or veiled. It is the root word for our English word everlasting. Christ remains hidden or veil from our sight until we search diligently to find Him. When I think of the word journey, I think of traveling across various landscapes and anxiously desiring to reach the place where I am going. We travel through many spiritual landscapes full of hills to climb, rivers to traverse, and deserts to cross on our way back to Christ. When I think of follow, I picture Christ up ahead on a night hike as it were. I cannot see very far to the left and to the right for there is darkness all around us. I know that if I follow Him. 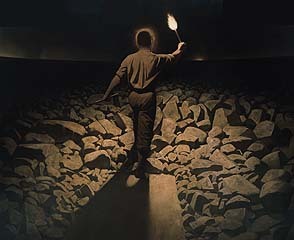 My Savior, and step where he has stepped and stay focused on Him, the light that emanates from Him allows me to see Him clearly ahead and very little else. This leads me to trust. Do I trust Him to know the way? Do I trust that he will guide me and walk beside me? For I am a child of God. By His grace and my feeble effort to learn to trust Him, follow Him, seek Him diligently and journey to where He will be waiting that He will be there waiting for me. We come unto Him not as much as He comes unto us. Getting to where he will be when His is sure we are ready to seen and know for ourselves is truly a trying and heart wrenching process. But how can we truly enjoy being in His presence if we have not begun to understand what He went through to be Our Savior in the first place? May we find Him and rejoice in His arms. I agree that everyone has an individual journey. As an early convert, I was given to know how important doing my ancestor’s Temple work. I am the only member of the Church in my family, so is my husband. I know engaging in that through the years has aiding in leaving the window to heaven open for us, that we might progress as well. I love your advice, to look up, and not look down. I know we need to be ever nearer to our Savior and Redeemer, that we may not only abide the day, but help others. Thank you all! I appreciate you including the “Do” in your advice. As I was growing up I kept hearing that I was being tested by God to see if I would live worthy to be with Him again. I found myself waiting for the test, and when something trying did happen, I wondered if I had passed. It wasn’t until I read in Nephi that I realized that I was waiting to be acted upon and that I needed to act. With further searching I found that the word “test” isn’t even in the scriptures, but the word “prove” occurs numerous times. I’ve come to understand that my purpose here is not to be tested but to prove to God through my actions that I desire His presence. To be tested is to be acted upon, to prove is to act. This changed my whole outlook on my life. I now look for ways that I can prove to God that I desire, and am worthy, to enter His presence. I do this by laying on His altar anything that separates us, anything that pushes His spirit away. I show gratitude when He reveals to me those things that I need to DO in order to be able to endure His presence. Love this, Dan! Great comment and insight! Thanks Dan. Very helpful awareness. Well done. I feel like I’m being led into His presence, and the more I learn to obey, the more I learn to trust, the more Joy I have. Like FJC, it is a peaceful process. I often wonder if the “trials” are in front of me or behind me. Mostly, I rejoice and anticipate the fulfillment of the promise.. Thank you for this wonderful contribution. Your opening statement about “trust in The Lord” cannot be overemphasized. It seems my life has been about contending with my natural man tendencies to not trust him. Every important step along the path to the presence of Jesus and Father has been preceded by a “trial of faith.” The progression of each trial seems to require greater humility, sacrifice and subjection to his will. When I first read “Following the Light of Christ Into His Presence,” I was surprised and thrilled to see for the first time in writing a clear description of the chronology and steps along the path I was experiencing. Later I found in 1 & 2 Peter the same clear description and chronology of these steps. I no longer felt alone. This is an important reason to keep the Un-blog going. Thanks to you and Shayne, and others for doing this for all of us. I now know that these trials of faith are of infinite worth to me. I cannot progress as I desire without them. I do not welcome them yet but I quickly recognize my opportunity to submit and trust as soon as they present themselves. There are many facets or steps along the path, both before and after the audience with Christ. The prerequisites prescribed for each step may occur in greater and greater degrees. However, I have found that the power to pass each trial of faith grows with experience and trust, and is not something to fear. Once you have passed a significant trial of faith – for instance the one preceding the reception of the more sure word of prophecy – the knowledge that it can be done will give you the confidence and power to face and pass the next trial. How true this wisdom has proven to be in my life experiences! So I ask, what is appropriate to share? Both Eric and Shayne are doing a wonderful job of encouraging us to press forward without saying things that feel to be too personal and sacred. The details of the path, after all, are truly individual. As I have pondered what would be good and wise to say, the idea has come that what has really helped me has been the understanding that actions the scriptures and the Brethren encourage us to do are, after all, the things that really work! One example. We are encouraged to keep a journal. So, over the past many years I have kept a journal. Sometimes daily, sometimes morning, noon and evening entries, sometimes days and weeks skipped. I have learned to write in my journal when the Spirit leads me to do so. Wow! I was surprised! So, I started reading and re-reading my journals from the 1960s, 1970s, 1980s, the 1990s, and the 2000s. How amazing my own journals are to read!!! I see in hindsight the paths the Lord led me on that were line upon line growth I so needed! I see that I had to learn the lessons of the1960s and 1970s before I could receive the growth and blessings of the 1980s. And I would not have been prepared for some dramatic changes that came in my life in the 1990s without the lessons learned the previous years. As I read the 1990s and the years of the 2000s, I see that I am after all a survivor. And more than that, I stand in awe at the blessings the Lord has poured out in my life – in His very individualized and personalized ways just for me. I have also learned that if you just picked up my journals from the 2000s and read, without having read in sequence my experiences before the 2000s, you would not – could not – understand. But for me to pick up these journals and read them – ahhh – there is manna for my soul! I am amazed to see that questions I ask today I asked thirty years ago and answers were given. Why am I still asking these questions? For the same reason that although I have read and reread the Book of Mormon annually for at least fifty years, I continually find new insights as I read again. My journals are loaded with my life’s personal questions, answers given, and scriptures and other sacred texts given for my learning and understanding. Also, there are accounts of precious personal spiritual experiences from thirty and forty years ago the details of which I had kind of forgotten. Reading them now brings a flood of memories and a reconfirmation of the Spirit showing me how much the Lord has led me, line upon line, to learn how to come into His presence. My journals in many ways have become my own personalized sacred works. Several years ago I became good friends with Hugh Nibley and we talked about journals. I once said to him, “There is so much that is so sacred in my journals. What do I do with them? I don’t want them to fall into the wrong hands!” He said, “Do not destroy them! If you have to, put them into plastic garbage bags and bury them out on a mountain side.” That is so Hugh Nibley! I will not do that. I will donate them to the LDS Church Archives in Salt Lake City, and they assure me they will protect them. 3. Rejoice as you are able to see the forest , and not just the daily individual trees of life and living. May we all be filled with “this love” and come into His presence is my sincere prayer for all of us. I believe that to a certain extent, this is to be anticipated. Satan doesn’t want you to excel spiritually, and will definitely put up roadblocks to thwart your progress. You may want to try these two things: First, ask Father in your prayers to reveal to you Satan’s designs, what he’s planning for you. That way, you can anticipate the direct opposition and avoid or go around it, preventing Satan’s fiery darts from striking you. Second, pray for increased protection — a virtual “spiritual shield” — around you, your family, your home. Create a spiritual environment where even angels are welcomed, and can protect you too, if necessary. I have a testimony of both these solutions. They have worked for me many, many times. I’m grateful for a Heavenly Father who wants me to be happy and not be punched by Satan if it can be helped. If I can be of further assistance, just let me know. I’m happy to help. I find the path very calm and peaceful, with no expectations, rather delight in the appropriate timing of the Lord, whether now, in this life, or eons from now, since eternity has no time. God is in charge, He knows when the time is right, let come what may. My job seems to be to pursue purity of mind, emotion, and mental perception, while being in harmony with the Holy Ghost. I find great joy in the moment by moment effort and a peace and harmony in my soul that reflects a glimpse here and there of great joy in spite of the craziness in the world around each of us. The approach that seems to work for me is more about being prepared than expecting. The Lord’s will be done, His timing is perfect always. I love this place. I love these words. Beautifully put. Thank you for sharing them. I have been finding much peace in my own journey. My heart was saddened today in Sunday school class, as a much respected and loved gentleman said that we will never have our calling and election made sure in this life. How grateful I am to be among friends here, that are filled with pure knowledge. Thank you one and all! Mel, I’ve mentioned before – here and other places – that there is a gathering going on. It is a gathering of faith and love. It is a gathering of people of common members who have started to truly glimpse the majesty of the gospel, and who have begun seeking earnestly that very personal relationship with Christ that the Church itself cannot deliver, as it must be sought individually. Above all, I believe it is a gathering of those who will be called to build Zion. Some, like myself, are advanced in age, and may only be laying the groundwork, perhaps by encouraging others who are younger and who will actually see Zion being built, and have a hand in it. I, of course, don’t know how it will all play out, but I do know that it will be glorious. As I increase my knowledge and desire the adversary increases with trials in direct opposition.